On January 7, 58-year-old Gale Haltom invited a homeless couple out of the cold from a nearby bus stop and into his house. An argument developed between him and Romaine Durrett, the man he'd invited in. That argument turned violent; ending with Haltom stabbed to death on the floor of his own home. That was murder No. 1 for the year. 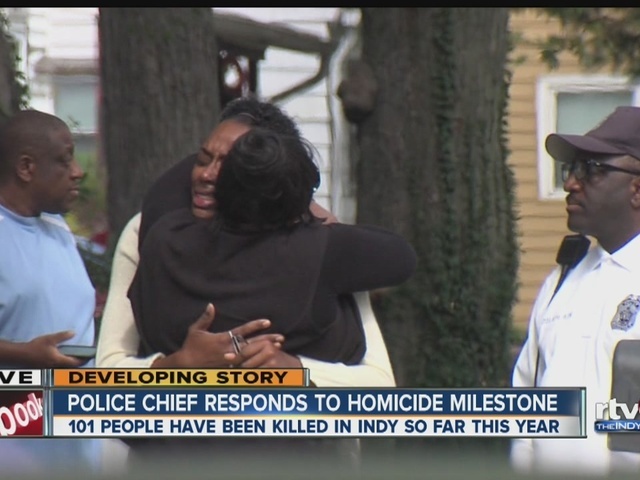 On Wednesday, 266 days after Haltom's death, Indianapolis marked its 100th criminal homicide. A few hours later that number ticked up to 101. The cases were so fresh neither victim had yet been identified. As of October 1, 82 men and 19 women had been the victims of criminal homicides in Indianapolis. Twenty two of those victims were under the age of 21 – including 3-month-old baby Janna Rivera and 10-year-old Deshaun Swanson . Swanson's death – the apparent casualty of a north side drug turf war – ripped his community apart. Long-time anti-violence advocate Rev. Charles Harrison of the Ten Point Coalition said "there has to be outrage" about his death for change to happen. But nearly two weeks later, Swanson's death isn't among the 43 homicides that have resulted in arrests, and police say they still have no suspects. Earnestine Havvard, whose son Clarence "Wade" Havvard, 32, was shot and killed just a few weeks and a few blocks away from Swanson (the 84th murder of the year), begged at a rally after the 10-year-old's death for something to change. In 2010 there were 93 murders in Indianapolis. There were 96 each in 2011 and 2012. The trend seemed to be heading downward from a high of 140 murders in 2006 – the second-bloodiest year in the city's history. The deadliest year on record is 1998, when 143 people were the victims of criminal homicide. But in 2013 that direction changed. The city saw 126 people murdered – a jump of 30 victims from the previous year. In 2014, 134 people were murdered. At the current rate, 2015 could end with 135 murders. The year began on a different tone, though. Until July, 2015's homicide rate was on pace to be lower than 2010's. At points during spring and early summer, the city had seen 30 percent fewer homicides compared to the same time in 2014. Then, in July, the number of homicides shot upward. Between January 1 and June 30 there were 54 criminal homicides – a rate of one every 3.35 days. In the three months since July 1, there have been 47 homicides. That means, on average, less than two days has passed between each homicide (the exact number is one homicide per 1.95 days). Without the spike of violence beginning in July, Indianapolis would expect to be ending September with about 81 homicides. If the violence continues at the rate it has since July 1, the city is on track to see 148 murders – which would make 2015 the bloodiest year on record. IMPD Chief Rick Hite released a statement Wednesday condemning all of the "senseless violence" in the city and pointing to familiar culprits: problems at home and drugs. "One homicide is one too many," Hite said. "We grieve for all 101 murder victims and their families who have been tragically impacted by these senseless acts of violence. As we look at the circumstances surrounding many of these incidents, especially recently, it is apparent we are seeing more instances where family disagreements and other family issues are leading to these fatal shootings, including assaults against children in our community." According to IMPD, 36 suspects were either an acquaintance or friend of their murder victim. Nine were family members or lived in the same household. One was a divorced partner. Of the rest, 51 suspect-victim connections were still unknown. On the north side of Indianapolis, in City-County Council District 3 (represented now by Will Gooden, but then by Ryan Vaughn), there was one murder in 2014. In 2013 there were none. In total, between 2010 to today, District 3 has had four murders in five years (Murders so far in 2015: 0). In District 10, less than two miles southeast, there were 20 murders last year alone – and there have already been another 14 this year. To the southwest of Gooden's district is District 8. With 15 murders so far this year, it began October as the deadliest part of the city. For District 8 Councilor Monroe Gray, Jr., that news came as a surprise. 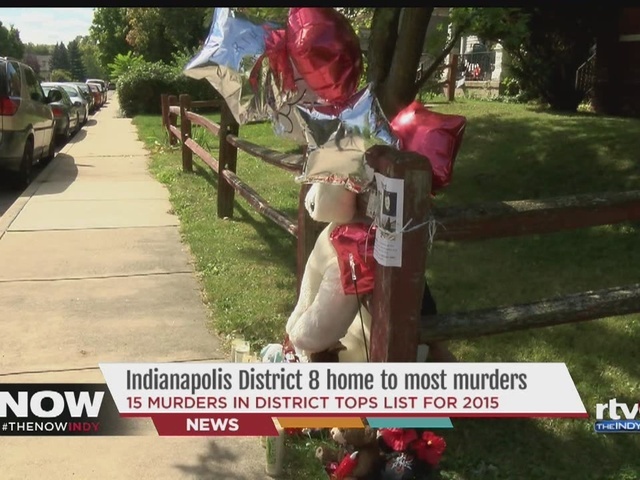 "I'm somewhat surprised we’ve had that many murders … that much crime in District 8," he said. "For years I've always advocated that District 8 was probably one of the low-crime areas." Gray's surprise might come because District 8, like most districts, is, in fact, largely violence free. District 8 includes Census Tracts 3219, 3211, 3210 and 3218 – which contain, among other things, Butler University's campus, the Indianapolis Museum of Art and large parts of the Meridian-Kessler neighborhood. None of them have had a homicide this year. On the southern end of the district, however, the map turns red. Census Tract 3905 – the neighborhood bounded to the east and west by Dr. Martin Luther King Jr. Drive and the White River – has had six criminal homicides this year. Directly to the east, Tract 3503 has had five. The tract to the north, 3220, has had three. What's the difference? In the MLK-White River neighborhood, an estimated 40 percent of households fall below the poverty line. Indianapolis' city-wide average is 18.9 percent. And, of the estimated 547 family households in the neighborhood, nearly 70 percent are single-parent. The trend seen in District 8 repeats itself across the city. Nearly 90 percent of census tracts in Indianapolis have had 1 or fewer murders this year. Just over 75 percent haven't had any. In fact, of the 101 murders so far this year, 63 have happened in just 24 neighborhoods – even as neighboring areas haven't seen any. The Indianapolis Metropolitan Police Department has called for more officers to address rising violence in the city. Councilor Gray says more officers, and more jobs, in his district is a good start, but that stiffer penalties for violent crimes are also necessary. For Rev. Harrison, who spends plenty of nights in the city's most violent areas advocating for peace, the solution will require "extraordinary measures." One of those measures will be taking on the "sub-culture that glorifies the gangster lifestyle." "We have buried our head in the sand and have not addressed this whole issue about not snitching, and we've become numb to the violence," Harrison said. "We have to be more vocal, there has to be more Rev. Harrisons across the city, and community leaders, that are echoing this so that we change the norms on the streets so that it becomes acceptable again for individuals who have information about violent crimes to bring that forth to the police so that we can get these killers and dangerous people off the streets." For now, for the people who live in neighborhoods where violence isn't just a statistic, but a fact of daily life, there's only one thing to do, according to north side resident Aleasha Ross. "The only thing we can do is hold onto our kids," Ross said, "love them every day and hope they will come back in the door."